Codex standards and related texts are voluntary in nature. They need to be translated into national legislation or regulations in order to be enforceable. 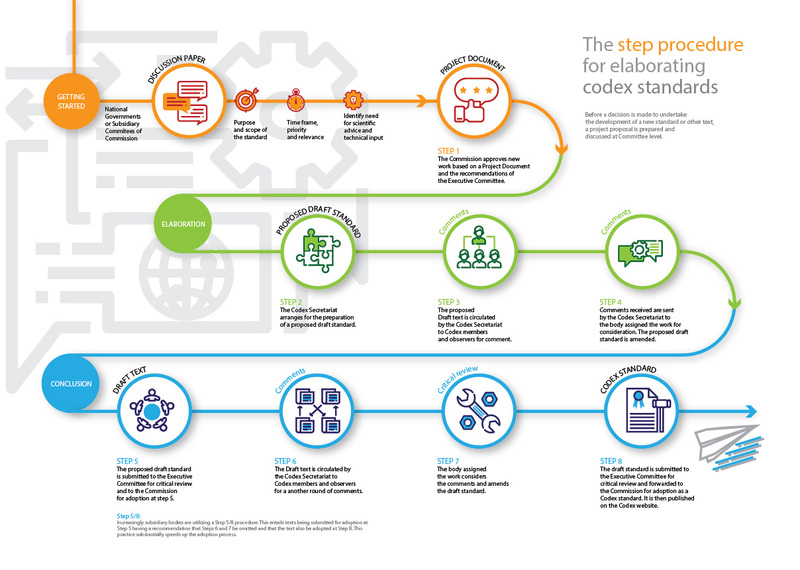 Codex standards can be general or specific. These are the core Codex texts and apply to all products and product categories. These texts typically deal with hygienic practice, labelling, additives, inspection & certification, nutrition and residues of veterinary drugs and pesticides. Codex commodity standards refer to a specific product although increasingly Codex now develops standards for food groups i.e. one general standard for fruit juices and nectars as opposed to one per fruit. The harmonization of food standards contributes to the protection of consumer health and to the fullest possible facilitation of international trade. How a Codex Standard is developed. Like all other aspects of the Commission’s work, the procedures for preparing standards are well defined, open and transparent. A national government or a subsidiary committee of the Commission usually makes the proposal for a standard to be developed They then prepare a discussion paper that outlines what the proposed standard is expected to achieve, and then a project document that indicates the time frame for the work and its relative priority. Getting started - The Commission reviews the project document and decides whether the standard should be developed as proposed. Elaboration of the standard - The preparation of a proposed draft standard is arranged by the Commission Secretariat and circulated to member governments, observer organizations and other Codex committees for two rounds of comments and special advice. Conclusion - Standards can take several years to develop. Once adopted by the Commission, a Codex standard is added to the Codex Alimentarius and published here on the web site. The process for developing a standard has eight steps. Download this infographic describing the process.